Nowadays it seems like all recruiters are measuring something, whether it’s cost-per-hire, time-to-hire, or their candidate-to-offer ratio. But are we measuring the right things and are we asking the right questions of our data? We know that every business is different and se we decided to make the second half of our presentation an office-hours session, so please come prepared with your questions! Ahead of our Q1 launch of Teamable’s Social Sourcing Platform we’re extending a special invitation to an early look at our new product and research. We’ve tapped into behavioral data from our existing partners and hundreds of hours of user interviews and testing to help optimize the process of sourcing high-quality, passive talent via social channels and your trusted networks. Attendees will also be able to schedule a customized walkthrough of Teamable's full platform ahead of our official launch. Recruiters are often the first ones tasked with addressing representation challenges within an organization by sourcing a more diverse recruiting funnel. However, hiring managers are the ones who have the final say on the makeup and composition of their teams. Recruiters have to be prepared to engage with managers, create a collaborative atmosphere, and win over the hearts and mind of hiring decision makers. 1. Work within the power dynamics between recruiters and hiring managers. 2. Focus on the business and moral case of D&I. 4. Ask probing questions to uncover biases and preferences. 5. Focus on competencies versus pedigree. 6. Building support to engage with managers. Join Sumayyah Emeh-Edu, Diversity & Inclusion Strategist and Jennifer Brown, President and CEO of Jennifer Brown Consulting as they share their experience of executing hundreds of diversity and inclusion programs. Did you know? Referred candidates are hired at a rate that is 8X higher than candidates from all other sources. That translates to significant cost reductions and time efficiencies for your organization. 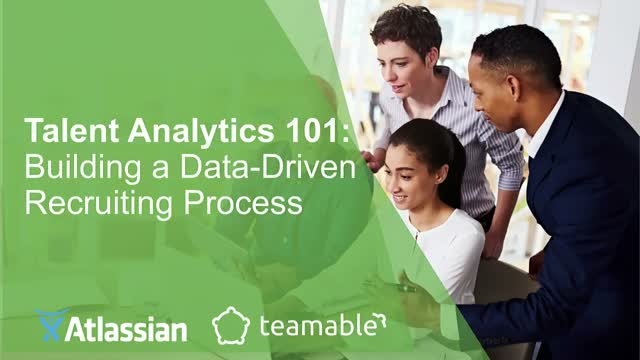 Tune in for a quick look at how Teamable is helping companies identify, engage and hire top talent with employee referrals. You'll leave the webinar with an understanding of how top talent orgs run and optimize their employee referral programs and what you can do to get started. The best talent teams in the business are fighting tooth and nail to transition from a service desk to a strategic recruiting model that drives partnerships, culture, and process. At Climate Corp, the recruiting team is taking a hands on and holistic approach to building and managing their hiring pipeline. Ashleigh and Dean will stick around at the conclusion of the presentation to take live questions from the audience. In many organizations today, recruiting functions as a tactical, on-demand service that is initiated by hiring managers and plays a supportive role. This state of affairs represents a huge missed opportunity. 1. Fit talent strategy into HR and the broader organization. 2. Align your talent delivery model with company goals. 3. Drive proactive talent acquisition strategies. 4. Create benchmarks to measure and prove talent value. Erin and Mike will stick around at the conclusion of the presentation to field questions from the audience. Leads from this webinar will be shared with Teamable and Lever. Today, diversity and inclusion efforts at companies big and small are more important than ever. Across industries, businesses are prioritizing efforts to create an inclusive work culture that attracts and retains a diverse cadre of top-talent. Adrianna and Tariq will stick around after the presentation to answer your questions and talk candidly about their work at Lyft. All the info you need to scale, optimize and make referral hiring easy.